VA / Soul Jazz Records Presents - STUDIO ONE Freedom Sounds: Studio One In The 1960s. Vinyl LP, CD. Bleep. The Soul Jazz/Studio One partnership spawns yet another wonderful LP. 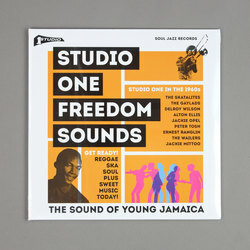 Studio One Freedom Sounds: Studio One In The 1960s focusses on arguably the label’s most successful decade. Clement ‘Sir Coxsone’ Dodd’s imprint cranked out the hits at a rate of knots back then - so strong was the Studio One roster at the time that you could get dozen great compilations out of their ‘60s catalogue. As it stands, the one we have here serves up eighteen killer jams from the great and the greater of Jamaican music. Features classic cuts from Jackie Mittoo, Alton Ellis, Bob Marley & The Wailers, Peter Tosh, The Skatalites and many more.